July 2008 In a wonderful world called gardening. I thought it would be difficult to engage children in the slow, quiet world of an organic vegetable garden, I thought they would become quickly bored and restless if things didn't happen fast enough. I took a deep breath before starting out in this journey, told myself I would have to be exceptionally patient, that they eventually would learn something even if it was only to be polite and show respect to the volunteers who came to help. I am happy to say, I have been proven wrong on all counts - that my nerves and lack of confidence were no match for the zest and enthusiasm of young children given a new tangible project and a promise of watch and wait. By the end of their first year of regular weekly gardening sessions through 4 seasons, year 4 students (8, 9, 10 yr olds) know to stop running when they get to the garden and slow down, greet volunteers, listen to instructions or information. They know they can work using their own new skills and thinking for themselves using information they have remembered and absorbed over time. They remind each other to walk on the paths, respect the garden beds and the lives in the soil. They do however rush to be the first to discover a new insect. The students surprise themselves (and us) every week with what they know. They learn to care for the environment, the soil, the water and the plants. They learn to recycle, to make compost, to build up the nutrition and health of the soil. They learn to turn everything in the garden that is unwanted into a useful thing that helps something or someone else. In a few short weeks, they learn that endless varieties of real food that you can eat, share with friends, that tastes wonderful and that costs only regular care, regular planning can grow in their garden. And it really happens! The REALNESS factor of a garden is the ultimate deciding factor in the usefulness of a Permaculture vegetable garden in a school setting. So many children today are growing up without the time or mentoring that it takes to become knowledgeable and aware of how natural systems operate. A well planned school garden program can give visibility to the words that are spoken in class rooms, on websites, in books about our environment, our health and our communities. Children can feel it, see it, smell it, hear it, taste it, do it and know it together and all in one go! 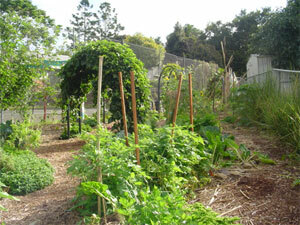 In Australia and in particular in our local area in Queensland, we are at the tip of the iceberg with our garden programs. They need to be recognized, accepted, and supported by every level of influence. And then the programs need to be practiced over and over again, shared between schools, promoted, spoken about and worked on to find the perfect fit into a child's learning journey and a teachers busy day. There are many places to take our inspiration from and many people ready to inject energy into this excellent cause. The UK is celebrating it's 50th anniversary of organic gardens in schools this year! In 50 years time, I hope we are celebrating ours!